Arizona has a wide range of misdemeanor offenses. Whether it be DUI, criminal traffic, domestic violence, drugs, theft, or any misdemeanor, it’s normal to be stressed and overwhelmed by Arizona’s criminal process. For many, a misdemeanor is their first encounter with criminal justice. It’s stressful dealing with the procedure and potential consequences. A good starting point is to contact an Arizona criminal defense attorney. An experienced criminal lawyer can ease your concerns and provide proactive advice to mitigate or avoid a misdemeanor conviction. What is a misdemeanor in Arizona? Arizona has three types of misdemeanors: class 1, 2, or 3. ARS 13-601. If an Arizona misdemeanor doesn’t specify its classification, it defaults to a class 2 misdemeanor. ARS 13-602(B). What are the potential penalties for each type of Arizona misdemeanor? While you cannot go to prison, jail can be imposed. Arizona misdemeanors can result in anywhere from no penalty to 6 months jail and 3 years of probation. Some Arizona misdemeanors, such a DUI, carry mandatory jail. The maximum jail depends on the misdemeanor’s classification. Here we address maximum penalties for each misdemeanor classification. 6 months jail, ARS 13-707(1). $2500 (plus an 83% surcharge), ARS 13-802(A). 3 years of probation, ARS 13-902(5). Common class 1 misdemeanors include DUI, assault with injury, threatening, disorderly conduct, drug paraphernalia, minor in possession, possession of prescription drug, driving on suspended license, aggressive driving, criminal damage, shoplifting, resisting arrest, and more. 4 months jail, ARS 13-707(2). $750 (plus an 83% surcharge), ARS 13-802(B). 2 years of probation, ARS 13-902(6). Common class 2 misdemeanors include minor in consumption, reckless driving, leaving the scene of an accident, verbal assault, criminal damage less than $250, and more. 1 month jail, ARS 13-707(3). $500 (plus 83% surcharge), ARS 13-802(C). 1 year of probation, ARS 13-902(7). Common class 3 misdemeanor charges include excessive speeding, leaving the scene of a parked car accident, assaultive touching, criminal trespass in the third degree, and more. Other penalties that might be imposed on Arizona misdemeanors. Collateral Consequences to Misdemeanor Convictions. A misdemeanor can leave a negative impact beyond a Court’s sentence. Any misdemeanor charge can result in a permanent conviction with collateral consequences. To understand the collateral consequences in your situation, it’s best to consult an experienced Arizona defense attorney. Here are the more common consequences of misdemeanor convictions. Permanent criminal record that’s accessible to agencies, institutions, and employers. Negative impact on one’s immigration and legal status. Loss of professional licensing or job opportunities. Child custody and divorce implications. What is the Court process for Arizona misdemeanors? Cases filed with only misdemeanor allegations are held in either justice, city, or municipal court. The specific court is determined by where the alleged conduct took place. Crimes within city limits are referred to city or municipal courts. Crimes within state property, highways, or unincorporated areas are sent to local justice courts. Each court has their own nuances and ways of doing things, but the framework of the criminal process is the same. Here are the types of hearings in misdemeanor courts explained chronologically. Initial Appearance. Those arrested and held in custody will see an initial appearance judge. The initial appearance judge merely sets release conditions and provides an arraignment date. Defendant given a citation or summons won’s see an initial appearance judge. Instead, their first court date is the arraignment. Arraignment. At the arraignment, judges read the charges, the rights of the accused, and the potential penalties. If this is the first judge you see, the judge will address release conditions. Unless you’ve consulted a criminal attorney and understand all your options, you should plead not guilty at the arraignment. Pre-trial conferences. These are informal meetings with the prosecutor to exchange evidence, negotiate, and discuss the case. Some courts have different names for these hearings, but they’re essentially the same: they’re designed to either resolve a case or prepare for it for trial. Pre-trial evidentiary motions and hearings. These hearings address issues of procedure, release conditions, evidence, due process, and constitutional violations. These motions often require a written motion and the presentation of evidence. Trial. This is where a trained prosecutor attempts to prove a Defendant’s guilt beyond a reasonable doubt by presenting evidence and testimony. The defendant also has the right to present evidence and testimony. Depending on the charges, either a jury or judge will determine whether a defendant is guilty of each charge. Tobin Law Office Provides Many Services in Misdemeanor Representation. Attend court dates on your behalf so you don’t miss work, family, or personal commitments. Arrange for phone appearances for those outside the county. File motions to modify release conditions. Raise pre-trial and trial defenses. Communicate with detectives and police officers. Negotiate for dismissal, diversion, deferred judgment, or reduction. Obtain discovery, evidence, and police reports. Invoke your right to remain silent. Interview witnesses and investigate the evidence. When necessary, fight the charges at trial. File motions to set aside a conviction and restore rights. 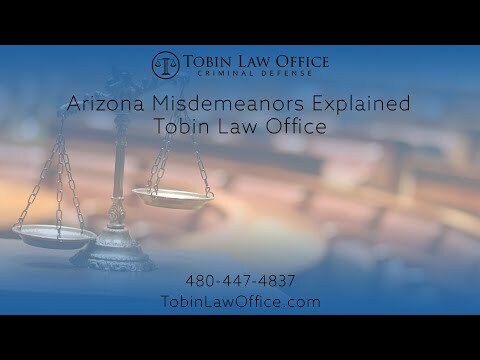 Call Tobin Law Office for a Free Consultation on Arizona misdemeanors. Tobin Law Office Offers Experienced and Knowledgeable Criminal Defense in misdemeanor representation.